A comfortable and convenient personal accessory kit for your Advanced Pump in Style or the Lactina Rental breastpump. Includes 2 Collection Containers, 2 PersonalFit standard size Breastshields, 2 Yellow Valves and Membranes, 2 Tubing, 2 Lids, one Container Stand, a Piston and Cylinder for manual pumping, and a breastfeeding information guide. Breastpump NOT included. 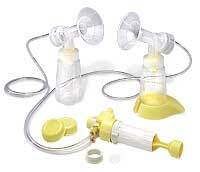 Breastpump kits are personal care items. For hygienic reasons, they can't be returned once opened. If this is accidentally ordered for the Original Pump in Style breastpump, the tubing can be made to fit by cutting the yellow ends off the tubing.